How Sherlock Changed the World re-aired August 28, 2016. Explore the impact Sherlock Holmes had on real forensic investigations. How Sherlock Changed the World reveals the impact Sherlock Holmes has had on the development of real criminal investigation and forensic techniques. From blood to ballistics, from fingerprints to footprints, Holmes was 120 years ahead of his time, protecting crime scenes from contamination, looking for minute traces of evidence and searching for what the eye couldn’t see. The film features interviews with forensic scientists, toxicologists, crime scene investigators and criminal profilers. Embraced by the public from his very first appearance in 1887, Sir Arthur Conan Doyle’s literary creation is more popular than ever, with multiple contemporary film and television series introducing new generations to the detective’s keen observations and lightning powers of deduction. Narrated by Andrew Lincoln, How Sherlock Changed the World features dramatized excerpts from several of Doyle’s stories, along with scenes from “Sherlock,” the MASTERPIECE series starring Benedict Cumberbatch. In an era when eyewitness testimony and “smoking gun” evidence were needed to convict and police incompetence meant that Jack the Ripper stalked the streets freely, Sherlock Holmes used chemistry, bloodstains and fingerprints to catch offenders. In many ways, the modern detective can be seen as a direct extension of Conan Doyle’s literary genius. Using interviews and archival materials, How Sherlock Changed the World, explores real crimes that were solved thanks to techniques, equipment or methods of reasoning Holmes used. Forensic scientist Dr. Henry Lee shows how he used blood evidence to free a woman charged with the murder of her husband in a mysterious case in Florida, and Karen Smith demonstrates how blood splatter patterns exonerated Dr. Sam Sheppard of his wife’s murder years after his conviction. 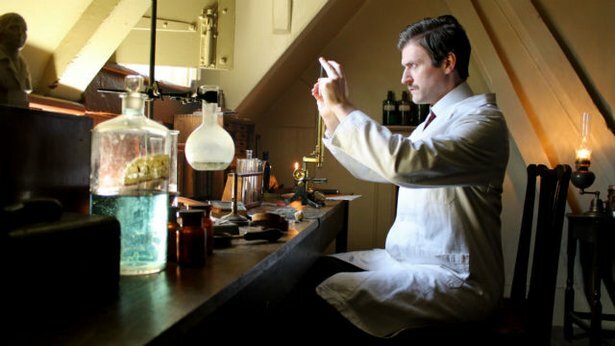 The history of Sherlock’s techniques from the 1880s to the present is explored, showing how the scientific methods he introduced to the world have evolved into the stunning CSI-style forensic labs of Scotland Yard and the FBI. Holmes was the first to use ballistics, including bullet trajectory, as evidence in criminal cases. Long before modern toxicologists developed sophisticated tests for chemical analysis, Holmes was using scientific methods to detect the presence of poisons, which for centuries had been used as an undetectable means for murder. Dr. Michael Rieders reveals how modern toxicology tests were used to unmask the true killer of Robert Curley, a Wilkes-Barre, Pennsylvania man who died of thallium poisoning. As Sherlock's fame grew, so did that of his creator. Sir Arthur Conan Doyle frequently received letters appealing for help with crimes. One such letter led Doyle to turn detective himself, and in 1903 his shrewd observations and experience as an eye doctor helped exonerate a man accused of brutally killing animals in a Staffordshire village. Even though Doyle proved the accused innocent, the police refused to believe it. The experience propelled Doyle to become an influential voice in setting up the first official British Court of Appeal two years later. How Sherlock Changed the World demonstrates that the legacy of Holmes, the first crime scene investigator, is not solely as a reservoir of brilliant stories and wonderfully drawn characters, but can be found in the development of modern scientific criminal investigation techniques and improved methods for capturing today’s criminals. in association with Channel 5 and National Geographic UK.